Student journalism is often swept under the carpet as another extracurricular activity to appease those budding writers and broadcasters with a creative outlet. Yet I would argue that student journalism has a great deal of value both within each participant's life, and within the university as a whole. With journalism constantly under attack from the President of the United States, I think that now is a time in our history in which it is vital to be encouraging young minds to pursue a career in journalism. Or, at the very least, gain an understanding of what this field requires and demands. To explore the value of student journalism more extensively I reached out to a variety of individuals ranging from those involved in Redbrick and BurnFM, to those working in services within the university. I hope that this will truly showcase some of the values of student journalism, and encourage even more people to get involved. Getting involved in writing (or editing other people’s writing) in a range of contexts for a variety of audiences is a fantastic way to hone your communication skills. But student journalism doesn’t only give you a platform to air your opinions! You need to construct an argument, get your ideas across clearly and succinctly, and develop your own identity as a writer so that your readers want to pick up the next issue. Working with Redbrick writers and editors who come to the College of Arts and Law Academic Writing Advisory Service (aka AWAS), I notice that they not only clearly enjoy writing, they are also keenly aware that argument, clarity and developing your own voice are key to academic success. And writing to frequent deadlines to produce copy for the paper keeps you going between essays - which can only be good! Whether reporting on a conflict in the Middle East or a planning application in Middlesbrough, a journalist’s job is to make sense of events and hold individuals to account. Student journalism is no different. It is perhaps easier to explain its importance by describing what the world would look like without it. First off, the readership - primarily students - would be much less informed about decisions that affect them; the introduction of education legislation or the sizeable expenditure of funds on a lawn would go more unnoticed and even more unchallenged. Secondly, institutions, such as the Guild and University, would be subject to far less accountability. The role that this plays in democracy is evident. Finally, the all-important student voice would struggle to be heard amidst the twenty-first-century hum of sensationalised gossip and updating statuses. Student journalism is central to the development of tomorrow’s professional journalists, yes, but its role has always been - and will always be - much, much more than that. The importance of student journalism is regularly overlooked by other students, the wider media and the institutions in which it is based. Student media has doubtlessly had an impact on me as an individual. It’s always been a comfort to have a place to express my opinions, speak to like minded people and create a publication that I am proud of. It has taught me skills across the board, from diplomacy and communication, to digital design and people-management. I am sure I wouldn’t have developed these elsewhere. Student journalism contains some of the most passionate people, working long hours (with no pay at UoB) to create a publication comparable to those created by full-time, paid adults. I am constantly inspired by those around me and what we have achieved alongside our degrees. Our articles have historically created controversy within the University, whether it be comments on meal plan, careers services or the Green Heart. This demonstrates that student journalism is a force to be reckoned with, it is pivotal for discussion amongst students and a way for us to communicate with the world. The student voice deserves to be heard, and journalism is the best way to platform it. Writing hasn’t always been what I’ve wanted to do. I kind of stumbled into it when the gaming editor posted a request for more writers and I thought I’d give it a go. Since then, Redbrick has given me an outlet to make myself heard and opportunities to meet other writers who have inspired me and given me ideas on what to do as a career. It’s not easy for me to put myself out there, but the support from others in student journalism helps you immeasurably. Whether it’s by giving me tips on how to make my articles less profane (sorry), helping with the notorious Adobe InDesign or by coming with me to events to cover, my colleagues at Redbrick have given me the confidence to keep going, and I don’t doubt that these feelings would be echoed by student journalists around the country. That sense of belonging makes things so much easier than going it alone, and now I’ve found the only career option I’ve ever been genuinely excited about. I had never before considered myself a writer. It was only after being persuaded by a friend to write about a subject I had been ranting about continually, that I thought I could attempt to channel it into an article. Since then, I have been prompted and encouraged to contribute to Redbrick more and more. I have since realised the importance of student journalism. It offers a rare opportunity to practice writing styles, as well as gain insight into the world of printing and publishing. It seems to me, more than just reporting facts, but also the inclusion of personal opinions and comments; a fantastically diverse collection of student views. Writing for Redbrick has shown me that writing, in some form or another, is most likely something I wish to pursue after University. This was a very important realisation as I had absolutely no idea what career I wished to follow. Redbrick itself is a truly fabulous thing. Not many universities can boast of such high-quality writing, and the sheer quantity of it at that. I for one am very proud to have the chance to contribute to such a wonderful student Newspaper. Student journalism is an outlet for expression. As a writer for Redbrick Film, this mostly means expressing how much I love (or loathe) something I have seen. The unseen value of student journalism is the opportunity it gives us to participate in broader cultural conversations. Several of our writers weighed in on the successes and significance of Black Panther during both its release last year and its awards season run last month, a microcosm of the broader discussion concerning the success of a mainstream film so directly addressing racism. These debates spark discussions on issues which are vital to discuss and culture which is fun to dissect, conversations which might have passed us by without the prompts offered by journalism. Student journalism creates a greater sense of community in doing so. University life can often feel alienating, particularly if you were used to a school where everyone knew everyone. Our writing is one of the ways in which university can feel more like a community; it amplifies student ideas and allows for them to be scrutinised by the rest of us in a way that nothing else can. Student journalism seemed like an inevitable part of my experience as an English Literature student. Tales of graduates always seemed to involve writing for their university’s newspaper, and it felt as though almost every course mate I met contributed to a student publication. For most of my first year, I regarded them with a mixture of disregard and envy. I didn’t feel I wanted to join in, because everyone was doing it. Yet I envied them greatly, for belonging to a long tradition of grassroots journalism, and creating pieces of writing beautifully exploratory of contemporary issues. My own feelings of inadequacy prevented me from having the courage to join them. Yet during my second year, my mentality shifted. I admired the insightful articles they produced and wanted to have the opportunity to share my own thoughts, in areas which mattered to me. I have developed greater confidence in my voice and discovered that the cathartic liberation of writing is somewhat addictive, whilst realising the intense mental energy required to produce seemingly effortless articles. My admiration of my fellow students has deepened, as I realise the huge dedication they all have towards their involvement in student journalism. Student journalism is important for numerous reasons. Firstly, Redbrick affords students the opportunity to discuss and initiate debates on issues/topics surrounding our university, its running, and matters which directly impact students (with such topics as Selly safety, the Green Heart and the Guild Elections exemplifying university-based focusses). Secondly, student journalism enforces the notion that there is something for everyone at university. With so many varying sections, Redbrick provides ample opportunity for students to write on what interests them and to meet others who share these interests. Finally, and perhaps most significantly, student journalism is refreshing in ways in which much of current journalism is not. University students are perhaps the largest group in society which debates a variety of issues, topics, theories, etc. on a regular basis. Whether studying for a degree in the sciences or humanities, we are perpetually encouraged to think for ourselves, voice our opinions, and ask ‘why?’. When this mind-set is applied to journalism, students produce and express poignant and insightful opinions which confirm our place as one of the most engaged and expressive groups in society. Student journalism matters. 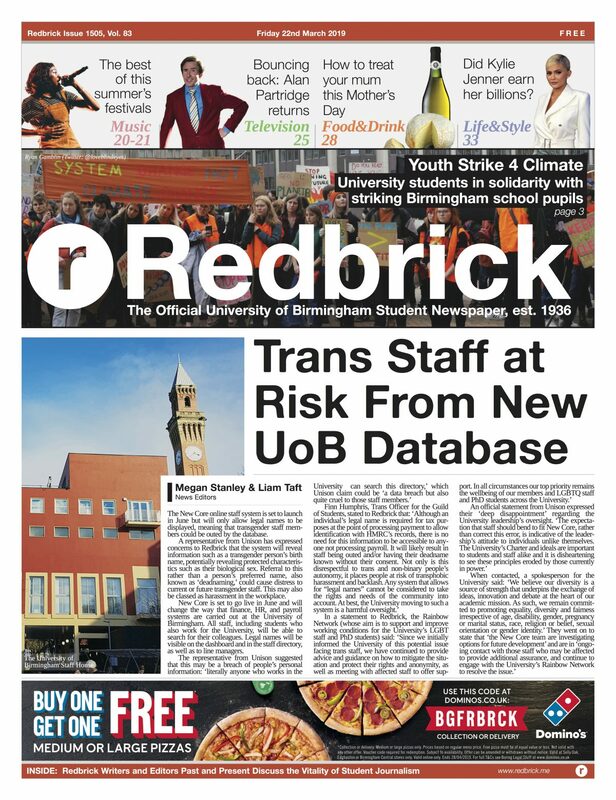 I got involved with Redbrick at the start of first year simply because I loved writing and sharing my opinion. As I have grown as a writer over the past year, Redbrick has become the basis of my CV and has proven to me that I want to pursue journalism after I graduate. It has helped me to secure internships but more importantly, it has allowed me to make connections with others. I have written freely about my experiences of spiking, assault and harassment. In light of this, I had many individuals reach out to me to share their experience, not only students at Birmingham but those beyond too. Seeing this article in particular in print made me feel that I had reclaimed some agency over what had happened to me. However, as much as Redbrick is about its writers and editors it is about its readers too. Redbrick’s reach is vast, making it an ideal space to discuss representation and create change. For me, this desire for change has often been grounded in a lack of class representation in Britain’s top universities but for other writers, their concerns may be race, gender, the environment, reliable news and so on. All valid areas of interest which are granted a voice and therefore some impact through Redbrick. Student journalism is an invaluable part of encouraging young writers and thinkers to begin sharing their thoughts and feelings with the world. I feel incredibly proud to help give a voice to students across campus, to bring a greater connectivity to all of our university experiences, and allows us to break down barriers that may otherwise keep us apart. As part of a higher education environment, we should be striving to promote discussion and the sharing of ideas, even on topics that are somewhat delicate, controversial or politically charged, because that is how we grow as young people and form our own ideas. As someone who doesn’t currently intend to enter a journalism career in the future, my experience with journalism has allowed me to grow not only as a writer, but as an editor, a thinker and a team-player, skills which I can and will employ in every job I enter. The huge passion that every member of Redbrick feels is something that everyone should have instilled in them, in order to be able to contribute to many different fields of employment. Student journalism breeds powerful and passionate young people: and people like that change the world. If a career in journalism is your dream, then gaining experience is an important step to show your commitment to writing. However, many student journalists get involved to acquire transferable skills that can make a big impact on their employability and add value to their CV, regardless of their career aspirations. It involves working with others, not only within student media, but also with a range of connections you make through researching your pieces. You need to be organised and see through projects to the end, whilst working to deadlines and strict word limits. There may be a chance to be involved in other parts of student journalism such as marketing, working with advertisers, designing page layouts, or managing social media. If you aspire to work in politics, you can write political stories accessible to the student audience. If you’re interested in marketing, look at ways you could help to draw in new readers, or develop a sponsorship package to market to businesses. Developing your writing skills via your degree studies alone is not going to help you stand out from other graduates. There is so much more you can gain from the experience of being involved in student journalism. Being a part of Redbrick has improved my first-year experience by helping me bridge the gap between adolescence and adulthood. An aspect of growing up is becoming an active member of society and participating in student journalism assisted me in doing this. It motivates me to keep updated, constantly checking a range of news sources and considering how I would approach the topics in article format. Also, attending Redbrick’s meetings has introduced me to students that refuse to be docile in the university system. Whether it is for News, Comment, Culture etc., all writers are given a chance to consider their views on the world around them. This is important considering that the last election saw the highest number of young voters for 25 years. The university students of today are more politically engaged, and student journalism is an excellent way to continue crafting them into active, opinionated individuals. One of the first things that people ask me when they hear I am part of student radio is how many listeners do you have? The truth is, we don’t know, but in my opinion, it doesn’t matter. We don’t do this for huge listener figures, we take part to learn and express our opinions. Student media to me has an impact by purely existing, it not only allows a gateway to many career paths but it provides a chance for students to express themselves. Just this year on Burn FM, I have been blown away by our diverse show schedules, opening conversations about living as a minority, toxic masculinity and LGBTQ+ rights. These conversations are vital to a healthy student population where students feel able to express themselves, whether it be through spinning their new favourite music or debating the latest Brexit news. If you end up spending your time at University doing any sort of student media, you will spend far more time working on creating something for your article, radio show or TV production than you will on your degree. To me, that shows the importance of having something to say and actually going ahead and saying it. Redbrick is a thriving community of people studying various disciplines, from various backgrounds, who are brought together by a passion for student journalism, writing, and involving themselves in something special. The variety of sections mean that there really is something for everyone, and as a cohesive team we are all able to indulge in our passions, and in doing so produce a beautiful paper every fortnight, and a fantastic repertoire of articles online. Redbrick is consistent throughout what for many of us is a time of great change and turbulence, and I am so thankful for its ability to hold my hand throughout my studies and life’s ups and downs. governmental surveillance and politics is encroaching on our liberty to express ourselves. If anything for me as a student, involved in student journalism, it makes me want to react to any attempts to control the voices of those who feel the urge to speak out. We as students, are involved daily, in a hugely multi-faceted experience at University; exposed to all social groups, minorities, privileges, cultures, identities, you name it and you have the opportunity to be educated in peoples’ opinions. So why not channel all these stories, lessons, disputes, disagreements, joys, in sophisticated journalism that is accessible to all, in free print and online publication, that epitomises what the documentation of human experience should stand for- equity and enjoyment. When I went to my first Redbrick Music meeting, I barely said a word. But if I hadn’t gone to that meeting, I wouldn’t have written my first review, or later put myself forward to be digital editor and been inspired to do a journalism MA. Student journalism gave me the opportunity to prove myself and the confidence to believe I could make a career in this industry. Right now, you might feel like you’re not good enough to turn your hobby into a career. I can tell you that at every moment - whether that’s writing for Redbrick or working for The Sunday Times - I’ve felt that too and learned that I was. I’m sure you are too. I’ve wanted to be a journalist ever since I can remember. I’d read the newspaper at the dinner table and would always watch BBC News. It also stems from seeing injustice and privilege around me, and looking for ways to challenge it. Good reporting enriches readers, makes them curious, and drives them to want to find out more. It also offers answers away from the interest of the powerful. After all, who better to publish articles encapsulating the ethos of student experiences than the students themselves? Student journalism is different to other journalism because it’s a peer-to-peer discussion. It’s us telling our friends and classmates the news which affects them. It’s important because we’re forming the next generation not only of journalists, but readers. After all, who better to publish articles encapsulating the ethos of student experiences than the students themselves? Since graduating from University the skills I have learned at Redbrick have transferred to my role in PR. You’ll find that the versatility of writing something other than a dissertation is valuable when you’re speaking to clients about their copy requests! I’m probably more than a little biased, but I think student journalism is of tremendous importance. Obviously, if you’re looking to get a job in journalism, you can’t really succeed without it, but I think there’s much more to it than that. Working with Redbrick was certainly the best thing I did at university – it taught me so much about managing multiple deadlines, making decisions and more importantly, justifying them. I think those skills are marketable to almost all employers across pretty much every field. If you would like to learn more about getting involved with student media whilst at university, head to the Guild of Students Website to find out more. You can also contact the groups via email or twitter. If you would like to talk to us in person, our offices are in the basement of the Guild. We are always happy to respond to your queries.